This is a major statement because abortion rights groups refuse to use any words that will “humanize the fetus,” and person is about as human as it gets. “Person” has become a legal word, not merely referring to homo sapiens, but to those human beings who are entitled to Constitutional rights. Clinton’s comments served as an oxymoron; one cannot be both a person and not entitled to Constitutional rights. As science has begun to definitively prove that the “fetus” is very much alive inside the womb, abortion activists have had to alter their approach. Many no longer insist that the fetus is just a “clump of cells,” but argue instead against personhood. Hillary’s husband, former President Bill Clinton, conceded as much in his memoirs, noting that the unborn child is alive, but not entitled to personhood status. The 14th Amendment is what guarantees all Americans have the right to life, liberty, and the pursuit of happiness. 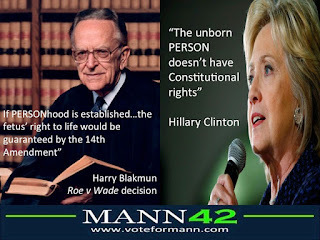 Hillary Clinton made the jump from fetus to person; from human with no rights to person with full rights. As she stuttered and stammered through her answer, she finally noted that we can’t sacrifice the mother’s right to make decisions. By the benign word decision, she was referring to severing the bodies of these unborn persons. The Justice’s point was clear: the mother’s rights are sole, unless we can establish personhood. Hillary (and science) has established personhood. It is time to reverse Roe and protect our tiniest persons.